For unaccompanied cello. Includes background information and performance notes by the composer. 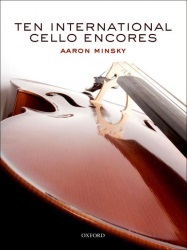 Minsky has composed this set of ten cello pieces based on musical styles from places around the world, such as Mexico, Ireland, Asia, Israel, Africa, the Caribbean, and America. Ten International Cello Encores is perfect for students and recitalists who are looking for fresh, new music for solo cello. Though made up of encores, it is excellently suited for performance as a concert suite.